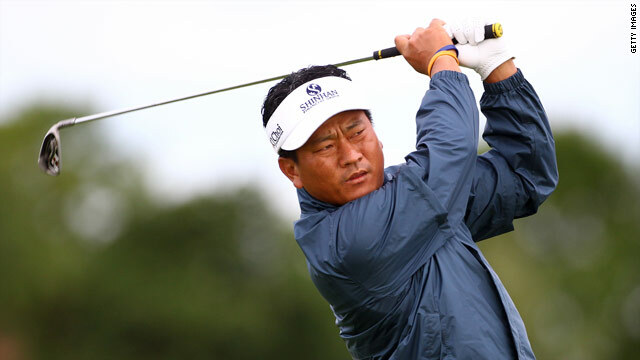 KJ Choi leads the way in the Scandinavian Masters as he bids for only his second European Tour success. (CNN) -- South Korean K J Choi holds a one-stroke halfway lead after 36 holes of the Scandinavian Masters in Stockholm. The 40-year-old carded a five-under-par 67, to add to his opening 68, to lie one stroke ahead of Richard Johnson and two clear of British Open champion Louis Oosthuizen. Oosthuizen, who posted an opening round 67, followed up with a two-under-par 70 for a 137 (-7) total, continuing the form he showed at St Andrews last week. He is tied for third place with Rafael Echenique of Argentina, who recorded a 69 on Friday. South African Oosthuizen is bidding to become the first player in history to win a European Tour event, the week after claiming the famous Claret Jug. "You've got to do what you've got to do, but I think I'll stick to my routine," the 27 year old -- who missed a string of second round putts -- told the official European Tour website. Both Choi and Swede Johnson are aiming to double their European Tour victory count. Choi's only victory in Europe was in the 2003 German Masters, while Johnson's was eight years ago in Australia. Italian Edoardo Molinari, who needs to finish in the top two to knock Englishman Luke Donald out of an automatic European Ryder Cup place, is four shots off the pace after a 71.